Our dexterous hafling follower of the fey lord of forgotten things, solitude and sadness has begun to take shape. I’ve picked a class and I’m ready to make the scant pieces of information come to life. The story of the our little folk is not an altogether happy one, but neither is it altogether sad. Born in the lands of the Vishov family in shadowy Ustalav, Minas was destined to have the life of a serf. Much like the Varisian families that had stopped their wandering ways and put down roots in Ustalav; so too did a number of hafling groups, dotting the land with small villages of the wee folk. Minas’ mother and father worked the land as farmers and his older sister would look after the boy while they would tend the fields. As the child grew, he too would work the land with his parents. That is, when he wasn’t wandering off into the woods nearby. Minas always felt more at ease alone with his own thoughts in the forgotten places in the forest. His parents didn’t so much enjoy their son’s need for solitude as it meant he lost time in the fields. His sister, however, always felt for him, seeing how uncomfortable the presence of others made him. The Vishovs were fair rulers and even their tax collectors and overseers treated those who worked their lands with respect. Although Minas was, for the most part, not inclined to want the feel of a big city, he did enjoy stories of city life. A few times a year when the Vishov’s representatives would come through to collect the harvests and hear the townsfolk one of them, a man named Herin, would tell the boy these tales. Herin had a way with Minas that overcame the shy halfling’s desire to be alone, and through this Minas was probably one of the most informed serfs in all of Golarion. When the halfling was just sixteen the unthinkable happened and the Vishov family fell from grace. The now widowed countess’ brother was accused of conspiring to overthrow the prince. Some who were complicit, including Minas’ friend Herin, were imprisoned. The countess was exiled and the land be overseen by Baron Creelisk through the length of her banishment. The change in rulership left the land in chaos. Baron Creelisk’s men were not as thoughtful toward their charges as the Vishov’s had been. On top of that scoundrels, thieves, and brigands were turning up everywhere. When Minas found that one such thief had arrived in town to hide from the authorities he took it upon himself to relieve the criminal of that which he had stolen. The boy’s original intention was to keep the item for himself and his family but guilt made him turn it into the authorities, and the rogue was arrested. Months later Minas’ sister went missing, lost in the night, taken from the family home. Although there was no sign of struggle neither Minas or his parents believed the girl would have left of her own accord. Of anyone, Minas was closest with his sister—she understood him even in his desire for solitude. Minas would spend days and nights searching for her. Days turned into weeks and weeks turned into months. Minas never gave up his search for his sister. In this he was occasionally joined by his sister’s best friend. In their time of quite investigation there grew a bond. Through the forest and the field, from town to city, the two never gave up and eventually fell in love. Alone but together with the shared hope of the return of Minas’ sister, her best friend. On a moon-shrouded night among the trees of the dark wood, they made a promise to each other and to Minas’ sister to never forget. In their sadness, alone but together they found some small hope in the worship of the Lost Prince. Giving themselves over to the Melancholy Lord, the fey lord of forgotten things so that his sister would never fall into his realm, never be forgotten. 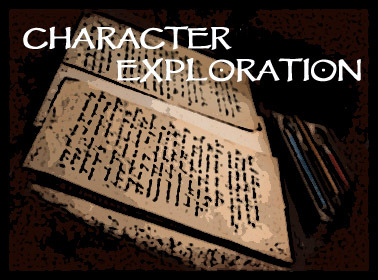 Using these disparate pieces of information, what character did you make? Why did you choose that class for this character? Who is your little halfling? If you enjoy seeing the process of creation please help fund what amounts to a second unpaid full-time job. Become a Patron today for as little as $1 by donating to my Patreon. If you can’t wait for new content on the CRBs schedule, look to the other forms of social media the CRB is on. Twitter, Tumblr, and now Facebook. Check out as I live tweet my games, see when I might be at a con near you, and find out when new works I’ve contributed to are being published. The CRB itself can also be sent directly to your Kindle by signing up for Amazon’s Kindle Subscriptions, don’t miss a single post.